In 2006, Ravi Zacharias International Ministries (RZIM) held an open forum at the Fox Theater in Atlanta to address the subject: Has Christianity Failed You? Tickets were sold for the event and to the complete surprise of everyone the event was sold out with a capacity crowd of over 5,000. People lined up offering to buy tickets from folks in line for higher prices. Before the event, an RZIM cameraman walked the streets and asked people if they had rejected the faith they held at one time. One answered that, because of a Christian s rejection of his gay lifestyle, he had done just that. Another answered that she had left her faith because she had fallen into adultery and could never live it down in the church. Others had their own reasons. Some said it was just intellectually untenable in an age of reason. They chose to come to the event to judge if there were adequate answers. It is estimated that for every one person who writes a letter or attends an event, there are one thousand who agree. If the Atlanta crowd was any indication, the question is real and troubling. Why is it that many live with silent doubt, many leaving the evangelical fold for something else? Is there something wrong with the message, the communicator, the hearer or is it all three? It s time to ask the hard questions of what it means to be a follower of Jesus Christ and why it seems as though God has made it so hard to continue believing. In fact, the son of a prominent U.S. Senator phoned me with that very question. Why has God made it so hard to believe in Him? Such skepticism is not just representative of the hostile; it also represents many honest questioners. This book attempts to lay out the response to those within as well as those outside the Christian faith so as to understand what it is we believe and why it is so hard to do so. More to the point: Why it is actually so hard to deny God and still make sense out of life? In the end the answers should be both felt and real, with the added truth that God is nearer than you think. He desires that we sense Him very near to us and not distant. But closeness comes at a cost just as any relationship of love and commitment does. 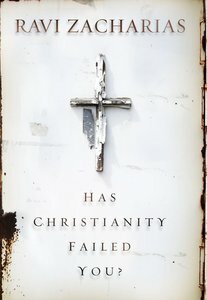 About "Has Christianity Failed You? (Unabridged, Mp3)"
Customer Reviews For "Has Christianity Failed You? (Unabridged, Mp3)"
Brilliant read. Ravi really nailed some points on Christianity and helped me to understand the frustrations I was experiencing with the church in general.